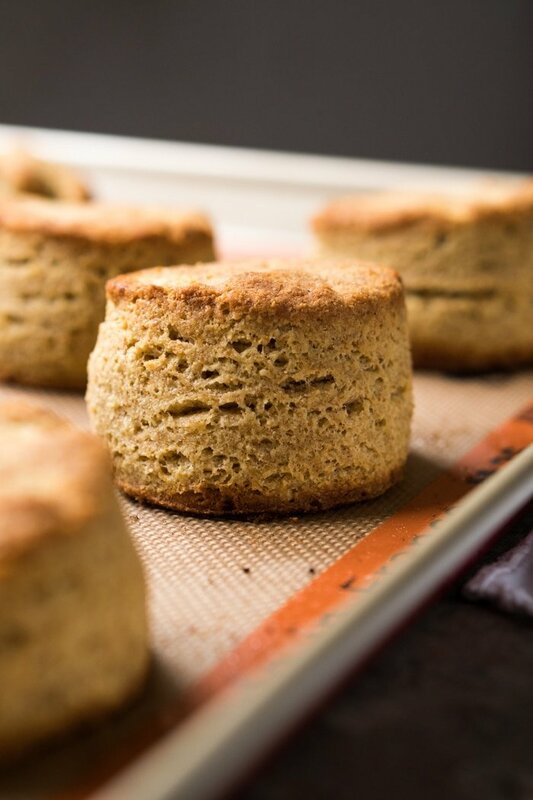 Mile-high, flaky and extra tender, we’re talking gluten free and keto biscuits! Think an awesome option for low carb meal prepping! 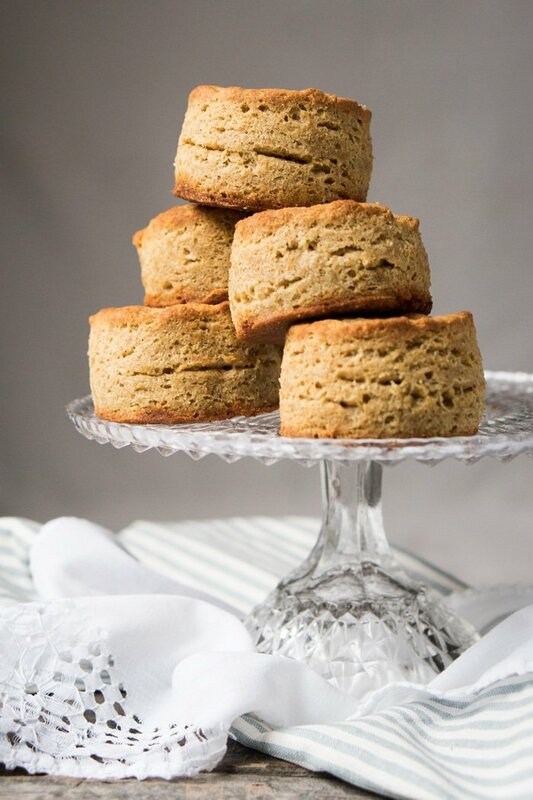 These grain free keto biscuits are one of those recipes which makes you go ‘how is this low carb?!’. They’re so good in fact, that I’ve been making batch after batch with the excuse of perfecting them further. Though in all honesty, they were already good-to-go three batches ago! They are a bit denser than regular biscuits though, more ‘whole-wheat’ per se. Though still beautifully flakey and tender. Think a true match made in heaven with our very-berry chia jam! The best thing? You can make a batch, freeze them, and bake straight from the freezer as needed! And they also freeze great baked, so whatever works for you. And the next best thing? These are veeery filling. As in I’ll award you guys a medal if you manage to eat more than two, and we’re already talking food coma territory here! A final note! Because of the layers and the folding, these guys do require a little bit of baking skill (think puff pastry or croissants… but easier!). So an easier alternative are our (30 minute!) keto drop biscuits. Same deal, just more tender and less flaky (see picture below!). If you’ve ever made flaky biscuits before, you’re off to a great start as these low carb counterparts are close in method to the traditional version. Though perhaps a bit more of a cross between a biscuit and rough puff pastry. 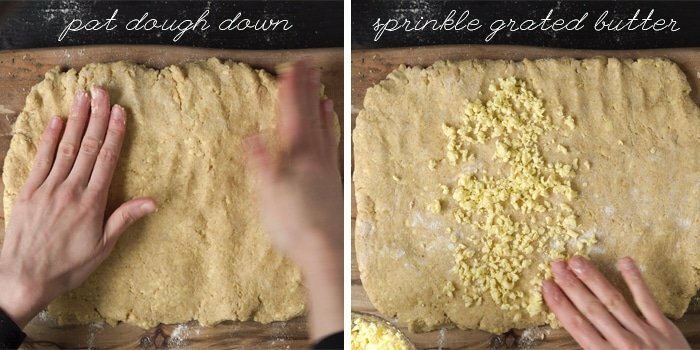 You see, you’ll be sprinkling frozen grated butter while folding the layers of dough to get an extra rise. 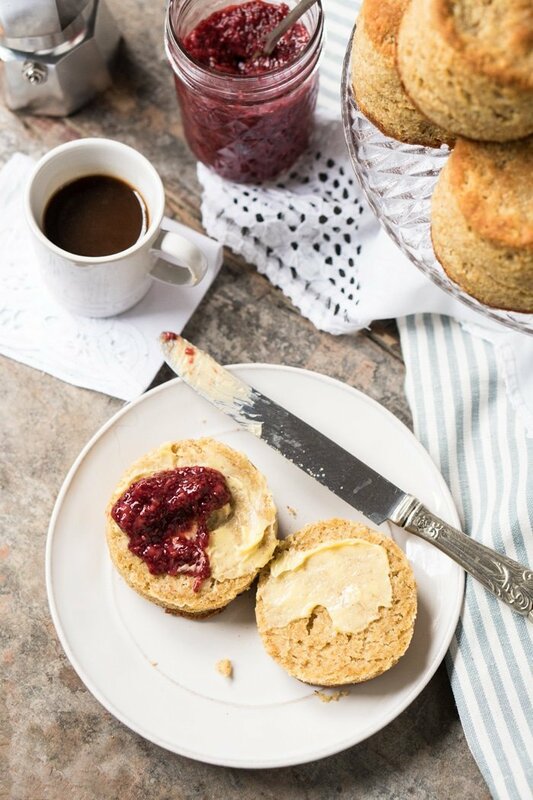 Because ahem… let’s face it, grain free flours always need a little extra help! Though these guys do get quite a decent rise: if you cut them 1-inch tall expect them to grow roughly 3/4 inch (that’s a 75% growth guys!). Work quickly and in a cool place as you don’t want the butter to melt. If it gets too sticky, pop it in the freezer for 10-15 mins. 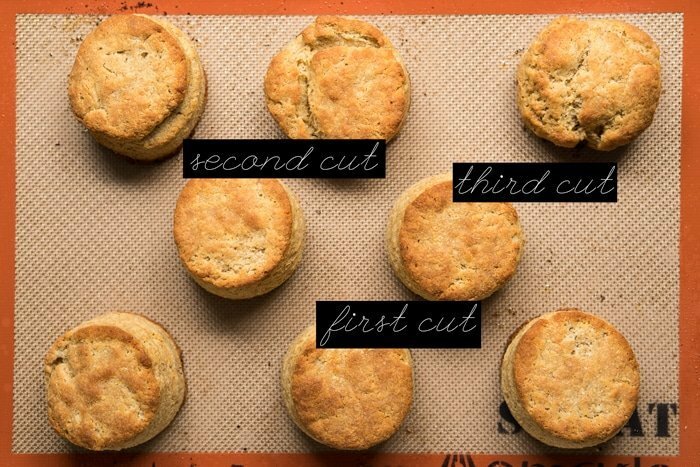 The first biscuits you cut will always be the best and flakiest. In fact, many top bakeries will throw away the scraps after said first cut. But since we’re working with precious grain free ingredients, we’re having none of that. You’ll fold the dough again and keep cutting. Just keep in mind that the first six (out of nine) will be the best, see pics for reference. Use a sharp cutter and cut straight down, without any twisting motion. This will ensure clean layers. if you don’t want to worry about 2 or 3, simply cut them as squares straight down with a sharp knife. I generally do that when there’s no need for ‘biscuit perfect’ photos. Seriously, cut them as squares unless you’re crazy set about the shape. Almond flour. 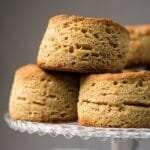 You truly need a super finely ground almond flour here, as if you use meal your biscuits will turn out dense and oily. Super fine almond flour brands include Anthony’s (my favorite), WellBees and Bob’s. Flaxseed meal. You’ll want to use golden flaxseed meal (I use Bob’s), and regrind the flakes in your (very dry!) bullet or blender until finely powdered. Great way to avoid slimy breads. Coconut flour. I always favor Anthony’s (best taste and texture! ), but Bob’s works great too. Whey protein isolate. 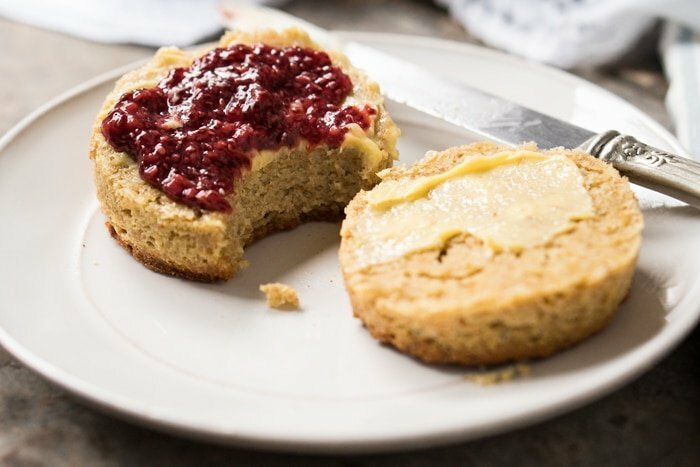 This one is an absolute must, as it will ensure your biscuits don’t collapse post-bake. Keep in mind that this ingredient varies tremendously from brand to brand, and we’ve only tried (and are super happy!) with Isopure’s Zero Carb Unflavored. Xanthan gum. Borrowed from molecular cooking, xanthan gum is the binding agent which makes your toothpaste jelly-like (and your cream cheese, well cream cheese-like). And it’s also the most common gluten-replacer in gluten free baking. And while we do prefer the results with it, you can sub it with twice the amount of flaxseed meal (so 4tsp)- not a huge deal here. 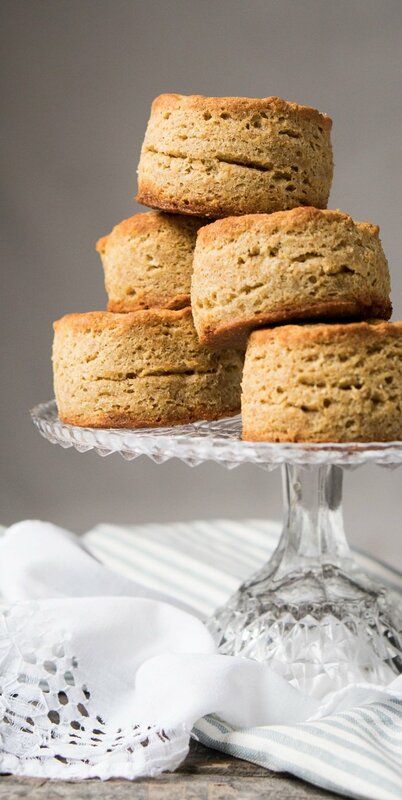 Mile-high, flaky and extra tender, we're talking gluten free and keto biscuits! Think an awesome option for low carb meal prepping! Place the butter in the freezer for 1 hour before starting. Grate it, and return to the freezer while you prepare the remaining ingredients. Add eggs, sour cream, water and apple cider vinegar to a medium bowl and whisk for a minute or two until fully mixed. Set aside. Add almond flour, flaxseed meal, coconut flour, whey protein, baking powder, baking soda, cream of tartar, xanthan gum and kosher salt to a large bowl and whisk until very thoroughly combined and no lumps are visible. Add in half the grated butter to the flour mix (84g/6TBS). Distribute it quickly with your hands, rubbing it against the flour briefly with your fingertips. 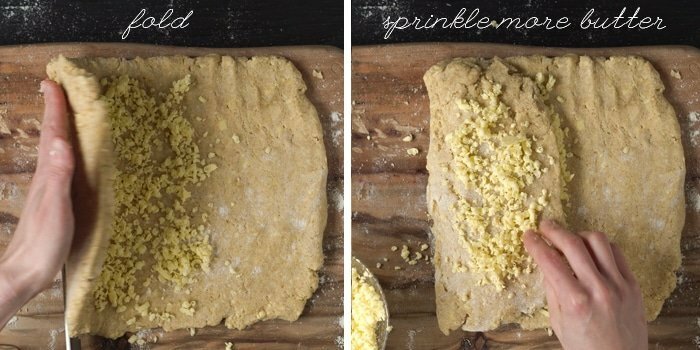 Since it's already grated, you won't need to 'break it into' the flours. Pour in the egg and cream mixture, mixing with a spatula until just incorporated. The dough will be very shaggy. Refrigerate for 15 minutes. Preheat oven to 450°F/230°C (do 500°F/260°C if using a convection oven) . Line a baking tray with parchment paper or a baking mat. Lightly flour your work surface with coconut flour and turn out the rested dough. Pat it down with your hands into a rectangular shape (roughly 14-by-10-inches). Sprinkle 1/6th of the remaining butter in the center, and fold in one of the edges over it. Sprinkle another 1/6th of the butter over the just-folded edge and fold in the remaining side (think like folding a letter!). Use a knife to help lift the dough if it's sticking to the surface (you want to make sure to not add too much flour). 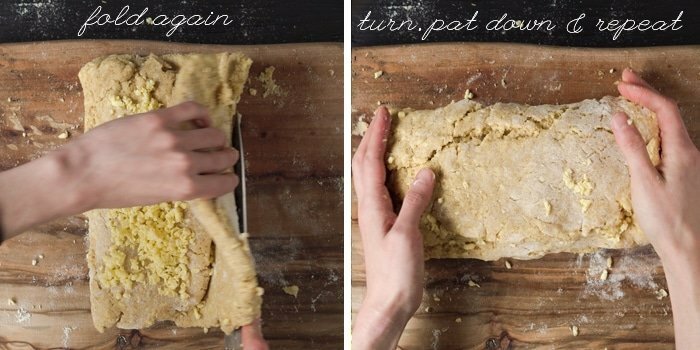 Turn the dough anti-clockwise and pat it down into a rectangle once again. Repeat the process two more times and pat the dough down until 1-inch in height. You could also do 1/2-inch height and yield 18 biscuits. Using a 2 1/2-inch round pastry cutter, score the dough to make sure you can get 6 pieces. Cut straight down (no twisting! ), and place the biscuit rounds onto the prepared tray. Gather the scraps, do another fold, and cut once again. Alternatively, simply cut into 9 squares straight down with a sharp knife (recommended). Pop the tray in the freezer for 15 minutes prior to baking. You can freeze the biscuits for 1-2 months at this point, and bake straight from the freezer as needed. Brush with melted butter and bake for 15-20 minutes until deep golden. Allow to cool for 10 minutes before serving. These guys keep well, stored in an airtight container at room temperature, for 3-4 days. *Maybe it's me, but I find that when adding whey protein isolate to baked goods much less salt is needed to season them. I found each batch to yield 9 (very large!) biscuits. You can alternatively pat down the dough to 1/2-inch (rather than one), and yield 18 of these guys. I made this! I did not have all the ingredients so substituted sour cream with kefir. I used coconut oil in place of grated butter to lower dairy impact and added slices of pepper jack cheese in between folds as my husband requested cheese be added. The result: he asked me how I managed to make it taste like sourdough bread! Two were left over and is in freezer for next weekend. We loved it and are so grateful to you. THESE ARE INCREDIBLE!!! Cannot believe how well they rose and how flaky they are! If I could leave 10 stars I would!! I read through the comments before making them and saw that they didn’t rise for a few people and I really suggest you read through the tips of keeping everything nice and chilled so the butter doesn’t melt and do a clean cut. My mom and grandma used to swear by those tips too and they make a difference! Totally my fault, but I was disappointed to see that mine didn’t rise at all. I didn’t remember to regrind the flax until all the dry ingredients were mixed. No turning back, so I proceeded. Also forgot to put them in the freezer before the oven. Even with no rise, they were so good! Crunchy edges and great taste! I can’t wait to make them again without the mistakes. Thank you so much for all the effort you put forth to get us these great recipes! Can something be used in place of whey protein? Collagen or egg protein powder? I wonder if there’s special tricks to getting a good rise with these types of ingredients? I’ve never made my biscuits using the method described here, so maybe I didn’t do it right? When I make non-keto biscuits I always handle the dough very gently and handle it as little as possible. Maybe I will try that next time and see if I have better luck? Thank you Missy for sharing in such detail!! Hope you keep loving the recipes!! Hi do these taste sweet? I was thinking about using these to make a keto cobbler. Make the shortcake instead! (search strawberry shortcake) xo! 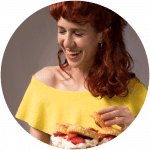 Check out the strawberry shortcake recipe though! Its based on this one, but has orange notes and is a tad bit sweet 😉 its super yum!!! I used ground chia seeds. They worked great. These are delicious. Thanks for sharing Mona! Awesome to hear! Paola, your recipes are great! I live at 6,000 ft elevation in Colorado and only got a slight rise out of them. I’m pretty sure I got the ingredients and prep. Can altitude be an issue with these? Any recommendations? Thanks!! So I just tried my second batch of these. They’re absolutely delicious! Thanks again. But… I have a problem. They just are not rising. For the first batch, I rolled with a rolling pin so I thought that was the problem. For the batch today, I used my hands. Tasty, but no rise. I used Wellbee’s, Bob’s Red Mill flax (which I ground to powder in my blender!) and the Bragg Apple Cider Vinegar. I even bought new baking powder and baking soda and with a brand I’ve always used for years, even in your other recipes. The 30 minute drop biscuits work like a charm and rise like crazy so I don’t know what could be wrong. I’ve baked these from frozen, thawed and right after mixing. Same result. I also use a sharp knife to cut straight down to form rectangles, no twisting. I kept the kitchen cold and kept the butter in the freezer so there was no melt. Would you happen to have any suggestion(s) as to why? Can’t wait to try these! Is the vinegar in there for the acid only? My mother can’t eat vinegar, so I was wondering if lemon juice might work. If it’s just the acid they need, I’ll try a batch with the lemon juice. Hi Christy! Yeah lemon juice would work, just add less (I would say half). You’re already getting acidity from the sour cream. I do find that vinegar tends to make keto baked goods more tender though, but I get your reason xo! Hi Paola, This looks very good. I am dairy free but I eat clarified butter and I can have whey. It’s the sour cream I’m having an issue with. I’m going to try it with some cashewgurt by Forager and see if it turn out. Alternatively, I’ve used Tofutti sour cream substitute, but it’s not really keto. Thank you for these crazy good recipes! Hi Kathleen! It’s my absolute pleasure 🙂 Regarding your subs, and in all honesty, these guys really do work best with butter (ghee just doesn’t quite give them the rise or flake unfortunately). The sour cream can be subbed with coconut cream and a bit more vinegar (I can’t do cashews, so I’ve never cooked with your sub). BUT, if you check back tomorrow, I’ll be posting a recipe for quick drop biscuits that work great with ghee, coconut oil etc. xo! Is there a substi3for the whey protein? Would a whey protein concentrate work instead of isolate? If not I’ll be sure to make a store run today! Hi Ariana! I haven’t tried myself, but another reader used the concentrate in the bread recipe and said it turned out great. So maybe worth a shot? You can whip up half a batch just in case xo! it sounds like a great recipe! just wondering, could i use a food processor to make the dough? Hi Lisa! You can, but in all honesty I got better results from using the grated frozen butter here. xo! I made strawberry shortcake with one of these biscuits yesterday. Words cannot describe my joy! Just added sliced strawberries and fresh whipped cream with stevia. To die for!! LOL that’s so awesome to hear! Pssst you guys will also be getting a proper strawberry shortcake soon (I whipped of a final version a couple days ago!). Easily one of my favorite recipes to be on the site! 😉 xo Patti! Saweet! Looking forward to it. oh my gosh. These look so good. I have to be dairy free. Can I use a shortening or hardened coconut oil in these? Hi Aimee! Yes!! Check out the directions and notes on freezing. You can freeze them shaped and bake straight from the freezer 😉 xo! While making these biscuits today, I decided it would be too much work to make again. However, I changed my mind after eating one. These are unbelievablly good. I am totally in awe of your low carbs cooking skills. Just wow!! Thank you so much for sharing your wonderful recipes. Patti I literally cracked up when I read your comment!! That’s so awesome to hear 😉 and thank you for your lovely comment- means a lot to hear you’re enjoying the recipes so much. xo! Hi these look fantastic. One question tho: you actually call for increasing the temp if using a convection oven. Is it not usually the other way round? Thanks! Can I sub the whey with Jay Rob Egg White Protein? Hi Caressa! Unfortunately egg white protein doesn’t behave the same as whey (I’m still experimenting with it to see if it will help somehow). xo! I used egg white protein today and they came out tasting great but they didn’t really rise much at all. It is really hard to find unflavored whey protein in stores. I will have to get some online and try it that way. Hi there! Love your recipes. 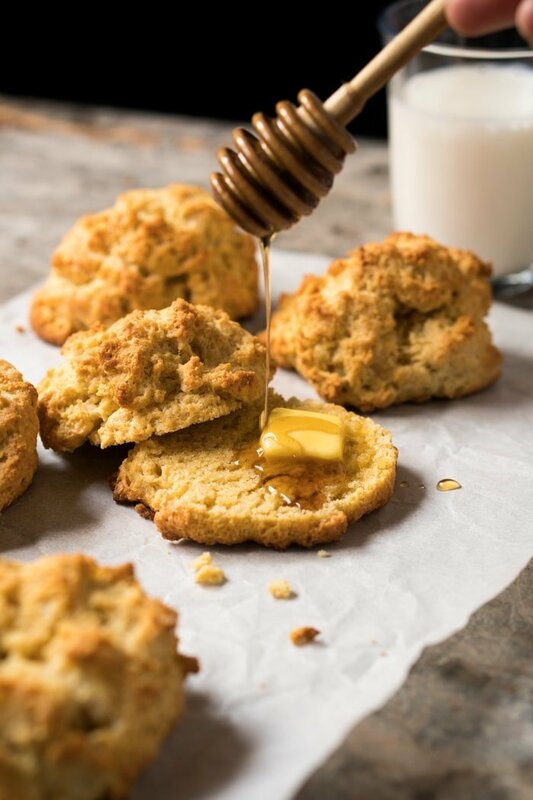 Have you published the mile high biscuit recipe on Pinterest yet? I can’t seem to find it in your boards. If not I’ll just save this email until I get a chance to try the recipe. Thank you and have a good day. Hi Andy! 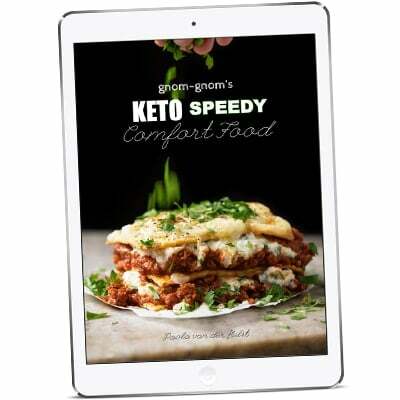 I did pin them yesterday to my ‘keto gnom gnom’ board (you can also see them here https://www.pinterest.com/gnomgnom/pins/). But you can also pin straight form the recipe page yourself! xo and hope you enjoy! These really are so delicious! And you’re right, no one would ever guess these were grain free. I’m convinced you’re actually a wizard!! LOL!! 😉 So awesome you enjoyed these so much Jennifer, and thank you for your ongoing support! xo! Is there ANYTHING out there that I can replace the coconut flour with? We hate coconut flour. Stinks and you can taste it in everything. Please help. Hi Cindy! I know what you mean completely, but in all honesty you don’t get that here. It’s also not a lot of coconut flour, so it simply lends a light sweetness and nice texture to the biscuits without being distinct. But if you prefer, you can sub it with more flaxseed meal (same amount). Just keep in mind that they’ll come out a bit denser (even more ‘whole wheat’). xo! Paola these are AAAAMAZING!! So buttery and delicious! Cannot wait for my hubby to try them tonight! Lol that’s awesome Jo! Fingers crossed your hubby loves them too 😉 ! !